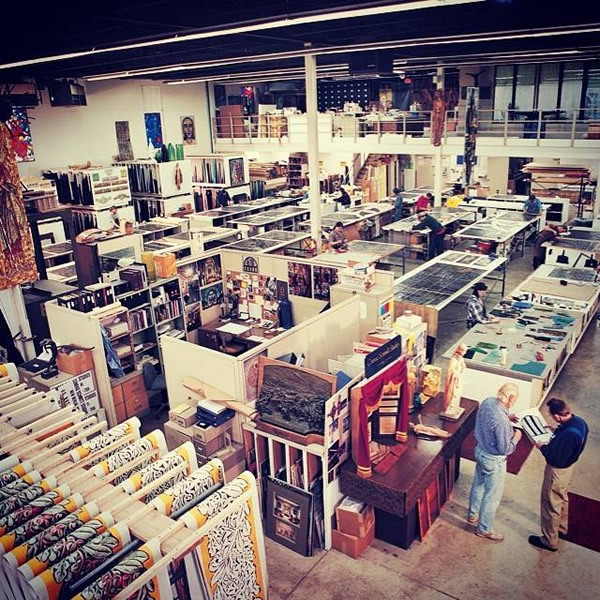 More than 125 years of experience make Conrad Schmitt Studios uniquely qualified to provide solutions in a variety of media – from the documentation of original decorative schemes to gilding, glazing, marbleizing, stenciling and trompe l’oeil. The transformation of an undecorated space through the addition of ornamental painting is an extremely rewarding process. When it is well done, the decoration helps to create a unified whole that tells a story of time, place, idea and vision in a way that perhaps nothing else can. 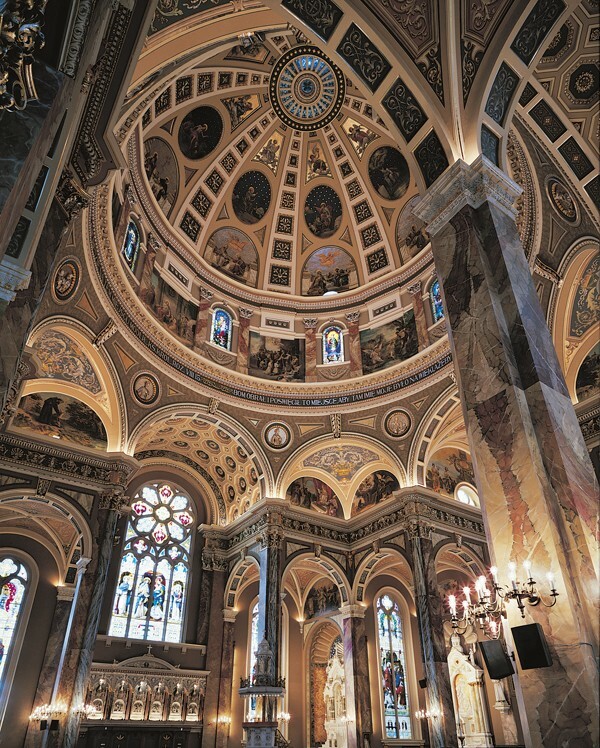 An artfully decorated church can elevate us and offer a glimpse of heaven. A theatre painted to create an atmosphere of blue sky, stars and a walled courtyard can transport us to a magical, outdoor dreamland. A stately capitol building or courthouse decorated with murals can express significant ideals and the history of a city, state or nation. The importance of painting and decorating in human cultural history is borne out in the fact that these are ancient arts. The sophisticated mural and mosaic decoration of Pompeii, Italy demonstrates that two thousand years ago artists, working in the homes of the privileged, were creating decorative painting and trompe l’oeil murals in which painted areas depict windows or sky so convincingly that they deceive the viewer. Decorative painting is a broad term, sometimes called faux finishing, that refers to painting techniques involving layers of color and design that enhance the architectural elements of a space and increase its ambience. These artistic techniques have been handed down from one generation to the next at CSS for more than a century. Polychroming is a technique that can be employed to enliven an interior space. Dating as far back as the ancient Greeks and widely popular during the Victorian era, polychroming entails decoration in two or more distinct colors. Paint is used to highlight the architectural details but, depending on the color scheme chosen, to dramatically alter the decorative effect of the space. This technique is especially stunning when used to draw attention to raised elements, where the use of another color adds to the contrast already created by the difference in depth. 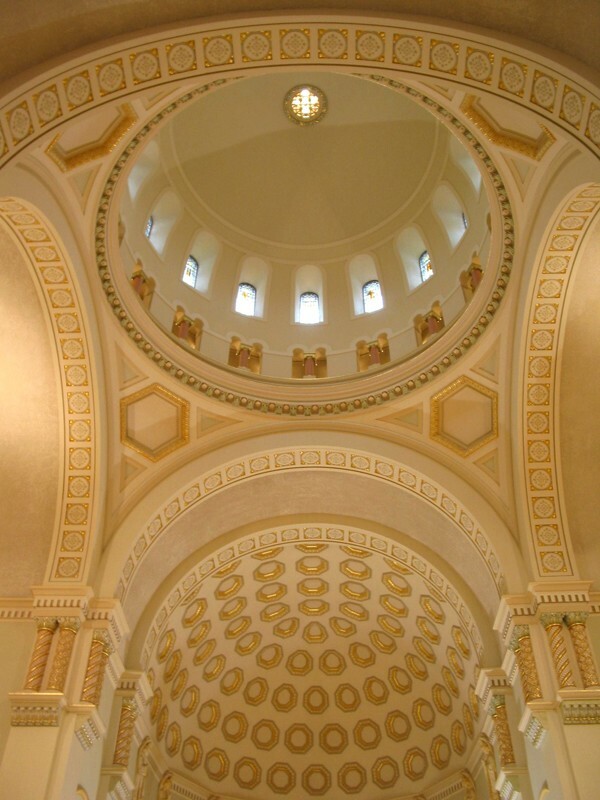 Large-scale decorative painting projects for significant buildings require more than trade painters. Rather, they are best served by artists in the fine-arts tradition. Clients choosing to select a decorative painting studio via the bid process must exercise caution because, in its current form, the process does not serve this specialty well. The low bidder on a project may or may not provide high quality artistry and longevity of the decorative scheme, which are the two most important results clients need. This can be addressed through contracting via interviews and negotiated proposals (rather than bidding) or through weighted criteria in bid documents for decorative painting contractors. Important considerations include the contractor’s ability to conduct the work with experienced, permanent employees, their past performance on similar projects, and their financial and litigation history. Whatever the process that awards work to CSS, the Studio’s integrity does not waver. CSS is committed by its own high standards to using fine materials and providing the highest quality results. With a limited budget, it can be tempting to commission less than the necessary preparatory work in the hope that a more superficial treatment will suffice. However, experience has shown that clients who choose not to thoroughly address the needs of a project the first time are likely to end up spending more money for the same results over a period of decades. Thinking twice about the appropriate approach to your decorative needs beforehand may be a better choice than having to arrange and fund decorating projects a second time down the road. The movement to preserve and restore historic American buildings has come into the mainstream since the National Historic Preservation Act of 1966. However, even in our relatively young country, restoration projects have been carried out since long before that time. 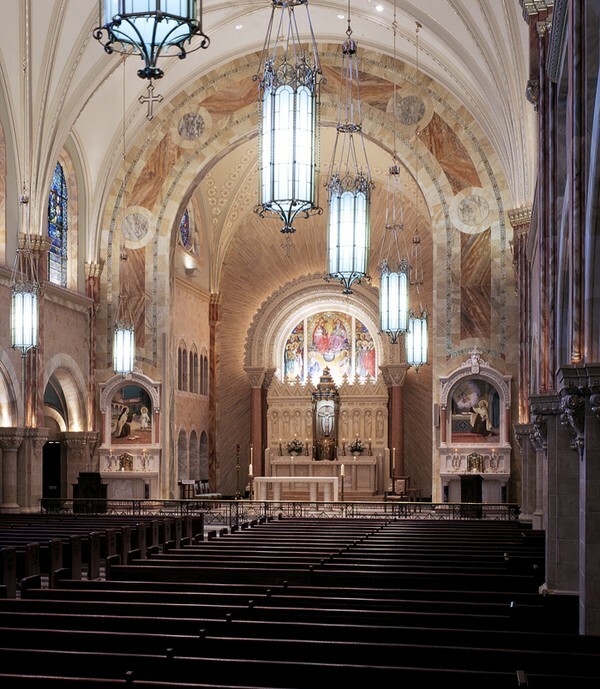 CSS’s first such project may have been the 1928 restoration of the Cathedral of St. Augustine in Tucson, Arizona. The involvement of CSS in the historic preservation movement grew during the 1960s and 1970s as Bernard E. Gruenke, Jr. became a strong proponent of historic preservation for churches and theatres. By 1975, he was a national leader in the movement to restore historic theatres and lent strength to related non-profit national organizations. In addition to restoration, the conservation approach, begun in Europe, has become increasingly prevalent in the decorative painting field. In many cases, particularly when the original decorative painting is in good condition, the artwork can be retained rather than repainted. A range of actions including stabilization, consolidation, exposing original designs, cleaning, infill painting to restore lost design elements, and applying protective coatings can be part of a comprehensive conservation program. A primary focus of such intervention is the reversibility of all treatments for posterity. The Studio works with clients, architects and other specialists to determine the best approach to a decorative painting or restoration project and to set a scope of work, timeframe and budget. Artistry, authenticity, longevity and cost-effectiveness are some of the primary issues considered in the formation of decorative solutions. 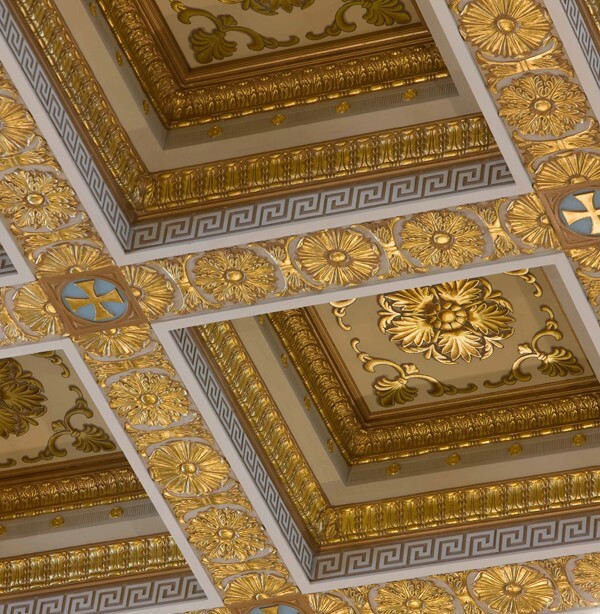 Whether a historic restoration or a new decorative scheme, the process of decoration begins with the architecture. America, the melting pot, naturally is home to a wide spectrum of architecture, and each period, style, building type and organizational affiliation has appropriate decorative approaches. That does not mean there is no room for creativity, but that knowledge of styles and periods improves the results of such a project. 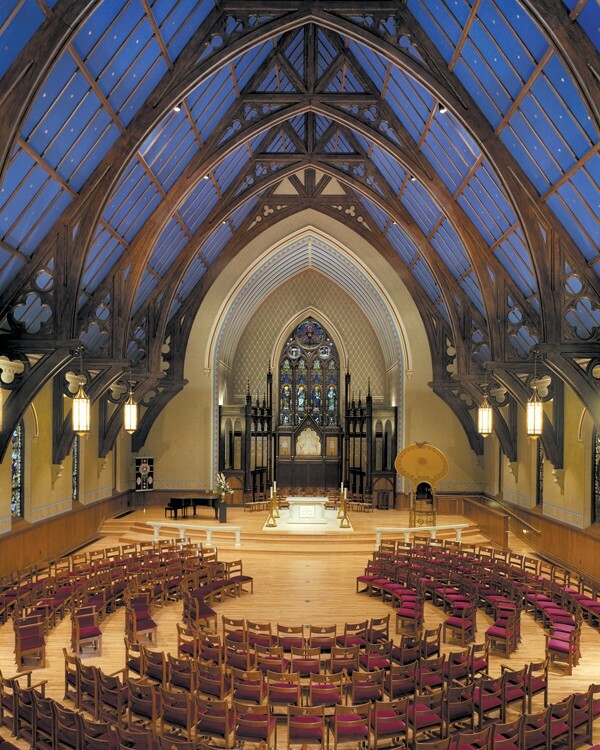 A Byzantine-design church for a Greek Orthodox congregation will require one approach while a Gothic Revival Catholic church will need another. A new lobby for a Baroque historic theatre will be approached differently than one for an Oriental atmospheric theatre, and so on. Work in the field is supported by research in CSS’ century-old library and archives, along with the internet, historical societies, public libraries and onsite archives local to a project. For existing buildings and restoration projects, the initial assessment reveals critical issues such as incompatible paints, water damage, past inadequate surface preparation and interior climate issues. Because these affect the longevity of the finishes, they should be addressed prior to the commencement of the decorative restoration. By nature, decorative painting projects are intrusive, primarily because of the scaffolding. However, CSS works closely with clients to accommodate their needs in terms of scheduling, sequence of work and access strategy. Projects are handled by an experienced project manager and conducted by crews of skilled artists, usually over a period of months. The result is a beautiful project that reflects quality and longevity and is completed on time and within budget. CSS is privileged to carry on the traditions of decorative painting. Many projects have won national awards, including a number of the National Trust for Historic Preservation’s coveted Honor Awards. Faux finishing is a broad term that refers to painting techniques involving layers of color and design that enhance an architectural space and increase its ambience. 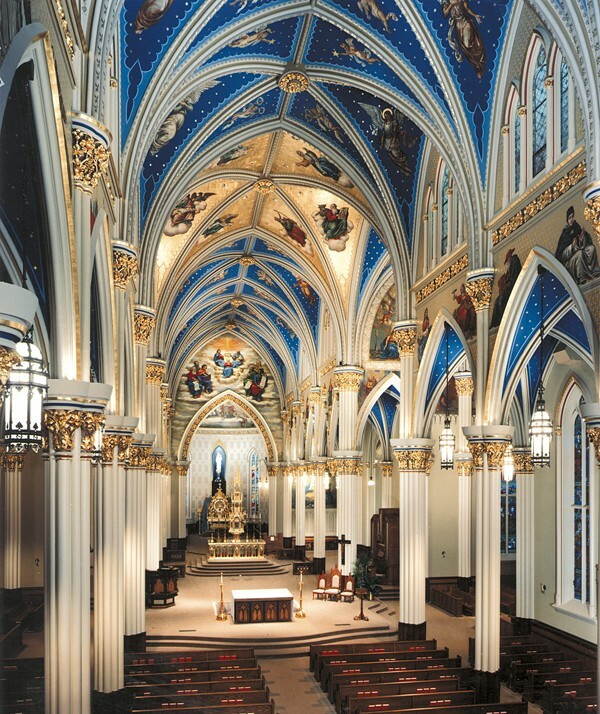 It often includes techniques such as stenciling, trompe l’oeil, graining, ragging, stippling, varnishing, gilding, glazing and marbleizing. These techniques add texture and interest to otherwise plain surfaces, and some are used to imitate different materials such as marble, granite, brick, leather and parchment. Decorative painting methods have changed little over the course of hundreds of years, although the materials have been improved. These artistic techniques have been handed down from one generation to the next at CSS for more than a century. Trompe l’oeil translated from French means “fools the eye.” It refers to a challenging artistic technique in which an object or scene is represented in photographically realistic detail with the appearance of three dimensions. Well done, it is so convincing that it deceives the viewer into thinking that they see the object itself rather than a representation of it. Widely used during the Baroque period, trompe l’oeil in America enhances the decoration of many traditionally designed state capitols, courthouses and churches. Common applications include creating the appearance of a different material, such as stone work, on a plain plaster surface. Designs and mouldings have been painted on walls and ceilings to give the appearance of architectural ornamentation, such as plaster or wood details, that do not exist. Faux framing on murals was another popular application a century ago. Trompe l’oeil is a storied technique that is created and restored by CSS. Glazing is a technique where a thin layer or layers of translucent medium is applied over a base layer of paint. Because the top layers are not opaque, the layers beneath are still visible, creating a rich quality of color. This same technique can also be used to alter the texture of the wall, allowing for even greater visual interest. 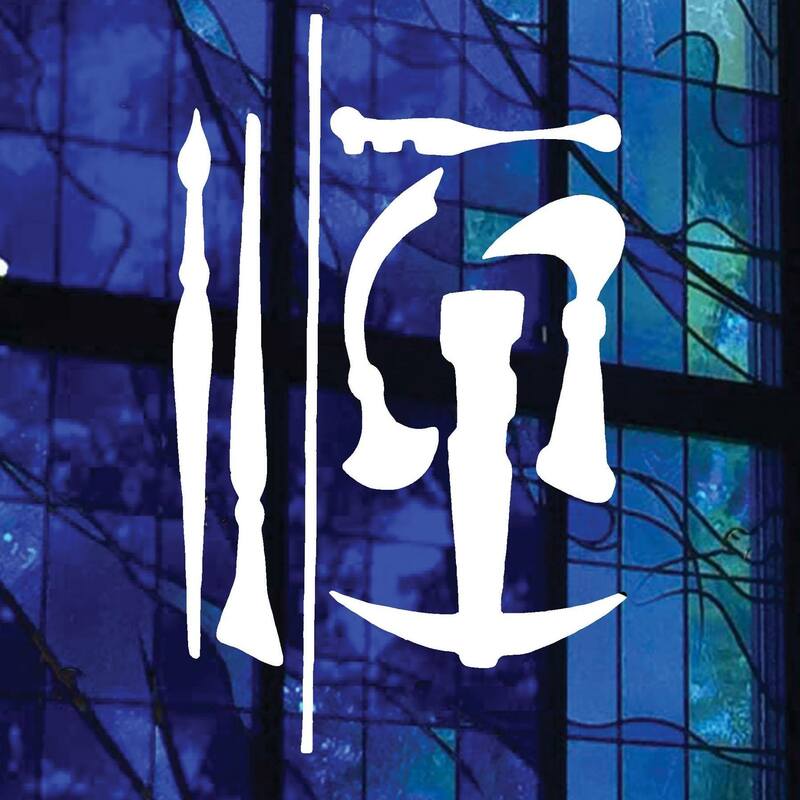 Materials and tools vary depending on the glazing method employed and number of layers desired, but the end result is nevertheless striking. A glaze is used to change the color texture of a surface. When the emphasis is on color, a glaze refers to a layer of paint that is thinned with a medium that makes it appear transparent. 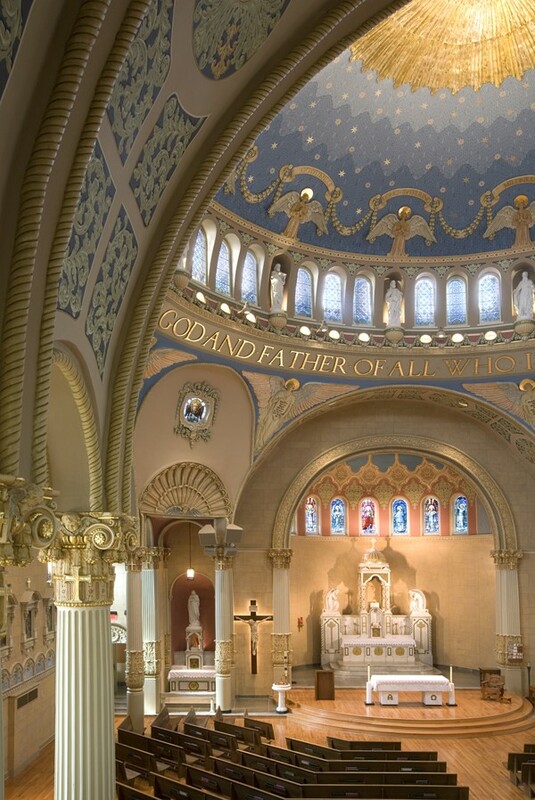 In terms of altering the texture, glazing is often applied over satin and eggshell enameled decorative and ornamental plaster architecture to create a smooth, antique appearance. The process of glazing begins with a thorough cleaning, drying, and uniform sealing of the surface. The surface is then lightly sanded to minimize imperfections and brush marks in order to improve the final appearance. Then the glazing liquid is mixed thoroughly with a small amount of pigment. Either oil-based or water-based materials are used for glazing. The glazing liquid is then applied to the surface. It is important that the entire portion of a surface must be covered at one time. Kerosene or linseed oils are used to extend the working time of oil-based glazes. Glycerin is used to thin water-based glazes for increased working time. After the application is made, it is partially wiped off to achieve the desired effect of antiquity. Like trompe l’oeil, stenciling dates to ancient times and, in fact, many trompe l’oeil projects incorporate stenciling. 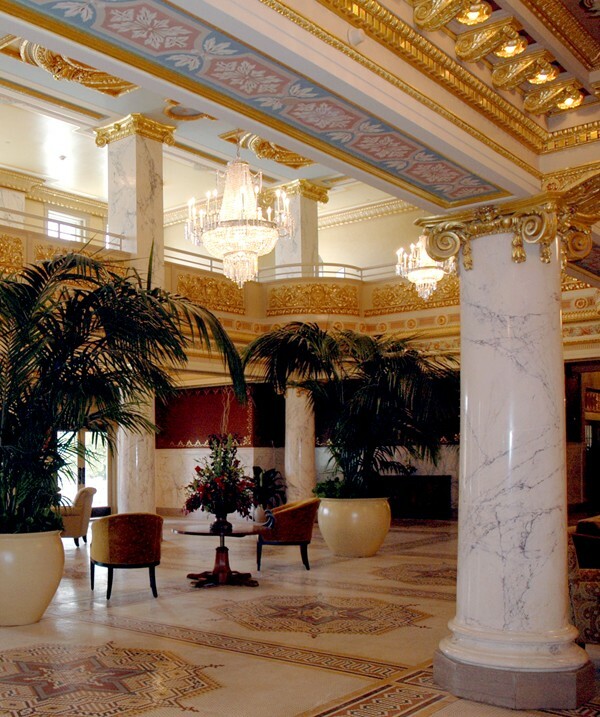 Artfully executed, stenciling can create stunning decorative effects that lend drama, beauty and character to a space, and it was installed in many turn-of-the-century American buildings. Architectural borders, botanical garlands, ethnic designs and elaborate medallions are just a few of the common applications. Stenciling is used to create repeating designs that sometimes add symbolic meaning, as well as sophistication to an interior. Stencil designs are most often cut from stencil paper or Mylar, either by hand or by a computer-guided machine. Historically, stencils were hand-cut from leather, paper or metal. Stenciling is accomplished by holding the stencils in place and brushing, sponging or ragging the paint or glaze into the cut-out designs. For many historic stencil applications, the final appearance is achieved through the use of two or more stencils as well as hand-painted accents. Gold has been used in decoration and ornamentation since the time of ancient Egypt. 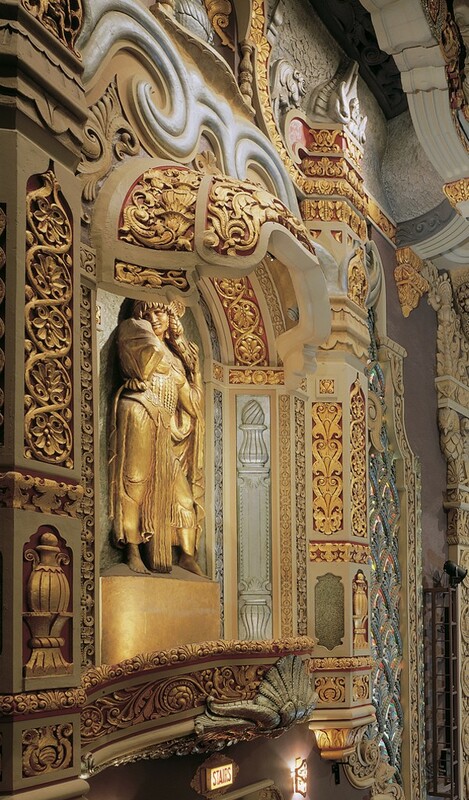 Solid gold is typically not affordable or very practical for decorative accents, so the technique of gilding was devised to provide a thin covering of gold over other materials. This gold leaf is beaten between animal skins until it is reduced to a thickness of about 1/300,000th of an inch, or 0.3 to 0.5 microns–so thin that it is translucent when held up to a light. Other metals used for leafing include silver, aluminum, palladium, platinum and copper. When 23 karat gold leaf is used, the gold will not tarnish and needs no coating. With other metals, including composition leaf–a copper and zinc combination that resembles gold–a protective layer is added to prevent tarnishing, but the varnish itself does eventually age. Many historic gilding projects originally incorporated composition leaf because the cost of labor around the turn-of-the-century was insignificant compared to the cost of gold. Now, in the twenty-first century, the cost of material versus labor is often reversed; thus, choosing a long-lasting material that does not routinely need to be reapplied, such as 23 karat gold leaf, can be a more economical route over time. In addition, the application of composition leaf today costs almost as much as the application of gold leaf because of the additional labor involved in adding the protective layer. Selecting real gold leaf for accents may seem like a luxury, but it is an enduring investment in beauty.